Tuesday, October 24, 2017 4:00 PM Randolph High School AWAY 50 Norwell High School HOME 15 Meet Recap The Blue Devils lost to a strong Norwell team today, at the home of the Clippers. The top team in the league showed its depth by placing the top 10 runners. 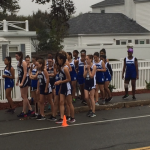 Middleborough was also in the meet.